The great thing about knitting for tiny babies is how quickly clothes can come together. This little sweater was so quick to knit up. The only thing that slowed me down was um, having to take care of the little babe who was to wear it. I made this little number for the upcoming cool fall days. So far the mornings are cool enough that he needs a sweater but by midday he could be in shorts. 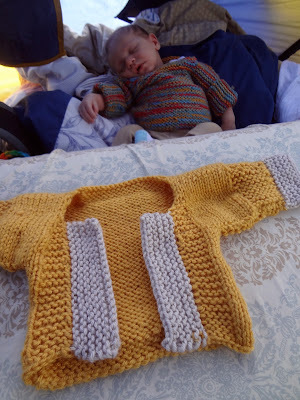 My other knit sweater I've made for him (shown on baby below) is too annoying to put on/take off repeatedly. Also I feel like this one won't be too warm for him to wear while he's in a carrier because the front is open. I roughly based this sweater off a pattern from Joelle Hoverson's "More Last Minute Knitted Gifts" but changed the dimensions a lot and then ended up realizing it was too small and added the grey portions for more coverage.